Hey there! I’m Sally from Hong Kong. I’m currently working as a marketing intern at TechPitch, and will be here for 6 weeks. It is my first time interning overseas at a startup. If only you could imagine how excited and nervous I was on my first day of work. Back in Hong Kong, I study Education, English and Politics in the University of Hong Kong. I have a passion for teaching, but I do not want to confine myself to certain work field. Having realized my interest in marketing and public relations, I decided to give marketing a go, and embark on this new journey in London. London is a lively and multicultural city. As one of the biggest international commercial and financial centres in the world, London is the birthplace of a number of international corporations, including HSBC, Shell and Vodafone, to name but a few. TeachPitch, being one of the emerging startups in this very city, managed to overcome all challenges, and continue to strive and expand its business in the ever-changing digital era. London and TeachPitch, for me, is exactly the place and company where I can hope to grow my personal and professional life. Through the internship, I hope to gain a bigger picture of the operation of different marketing stages, experience first-hand the startup working culture in which everyone works together towards a common goal, and gain insights into how overseas companies promote their products to their targeted clientele with different marketing strategies within different cultural contexts. TeachPitch is a learning platform created to help teachers and education institutions to identify the best online education resources in the quickest way possible. I have had two teaching practicum back in Hong Kong and I understand how difficult it is for teachers to search for useful learning materials given the limited time and budget they have. Being able to join the dedicated team that endeavors to make teachers’ everyday teaching and self-learning easier gives me a great sense of satisfaction. 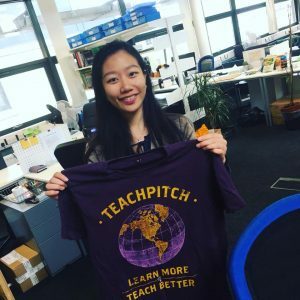 I enjoy working at TeachPitch not only because the team share the same passion in initiating a change in the education industry, but also because the experience itself is an invaluable learning opportunities. Working at a startup, there is no clear division of labour between departments. From marketing research, to the development and the implementation of promotional strategy, I get to implement my ideas step by step. This is exactly what I would expect my internship to be — insightful, educational and rewarding. The TeachPitch team is always helpful and they value everyone’s ideas. This helps a nervous intern like me to adapt to my working environment easily. Aldo, the founder of TeachPitch, always tells me that it is better to do something (even if it’s not perfect) than do nothing and make no mistake. He shows his trust in his team and make sure everyone’s potential is unleashed. That encourages me to voice out my opinions, dare to make mistakes and learn from them. Another thing I like about working at TeachPitch is the flexible working hours. As long as you can get your planned tasks done, you can always leave early and enjoy the rest of the evening! I always find marketing an interesting and meaningful field to explore. By presenting and promoting a product to your target audiences, you make sure the product is fully utilized and reaches out to people that needed them the most. I am looking forward to working with the TeachPitch team in bringing out the best online learning experiences for educators!